With a powerful combination of thorough assessment, deep tissue massage techniques, joint mobilization maneuvers, strategic stretches and myofascial release, Erik Dalton’s Technique Tour Online is a powerful part of the Myoskeletal Alignment Techniques (MAT) modality that helps all kinds of clients deal with all kinds of pain. A practicing manual therapist for more than three decades and a leader in the field of non-invasive pain management, as well as education, Dalton developed MAT as he continually sought to better serve his chronic pain clients. In an effort to bring these folks relief that lasted well beyond the bounds of the session room, he began to blend techniques and knowledge from a variety of sources into his own foundational education as a practitioner of structural integration. For example, Dalton attended workshops, seminars and university courses that focused on osteopathic medicine. He also studied the work of Vladimir Janda and other such groundbreaking pioneers, continually expanding his knowledge of the origins and effects of pain, and integrating these concepts into his own hands-on work. Even now, Dalton remains an avid reader of a broad spectrum of scientific literature on the topic of pain and physical function, always seeking more knowledge to help people in pain — and the manual therapists who serve them. A widely revered educator, Dalton has been teaching others how to apply MAT since he released one of the industry’s first nationally approved home study courses, “Myoskeletal Alignment Techniques (MAT).” In fact, it was the overwhelming positive response to this initial distance-learning product from that inspired Dalton to open his own teaching facility, called the Freedom From Pain Institute. 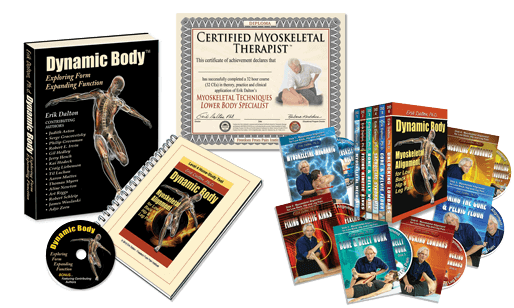 Today, Dalton is the author of three best-selling manual therapy textbooks and a wide range of highly popular home study and online continuing education programs. Among the reasons MAT has proved to be such a successful modality when it comes to pain management is the fact that it blends several potent techniques into one method of manual therapy, so that practitioners can move from technique to technique as needed, or use a combination of hands-on maneuvers to bring about the most positive results possible. Students who sign on to learn MAT via Dalton’s online e-learning continuing education or home study packages have the benefit of being taught a diverse range of valuable techniques to help serve clients with an array of painful issues and conditions. For each specific scenario a manual therapist may be presented with in his or her practice, Dalton clearly explains the possible underlying causes of the issue, how to assess the client to confirm the condition, and then how to apply the appropriate range of MAT moves to eradicate pain. From deep tissue massage and joint mobilization to myofascial release and assisted stretching, the hands-on techniques MAT students will master can help give clients long lasting pain relief right away, as well as pain prevention for the future. As an example of the specific usefulness of each of Dalton’s lessons, you can watch short YouTube clips on MAT-related topics like Simple Technique for Treating TMJ and Jaw Pain. These brief clips cannot replace actually taking the classes and receiving one’s credential as a Certified Myoskeletal Therapist. However, they do offer a fantastic preview of the high caliber of instruction one can expect upon enrolling in any kind of Dalton workshop or class. Though many massage therapists, bodyworkers and other manual therapists may be familiar with myofascial release or even use it on a regular basis within their session work, the focused goal of easing and managing chronic pain and specific issues such as TMJ with this and other strategic techniques — including proper assessment protocols — sets MAT apart. For instance, in the potential case of TMJ, practitioners can learn exactly what to do when a client mentions his or her clicking jaw, in order to address jaw-related muscle imbalance patterns before any irreversible damage has been done.